This is an electronically powered system that takes natural energy stored in the earth to heat and supply hot water for your home. For every kilowatt of electricity used to power the heat pump, the system could generate four kilowatts or more in energy, using sustainable energy. The return varies depending on the temperature of the heat collected and heat required for the property. The technology inside a heat pump works on similar principals to a domestic refrigerator, using the principals of thermodynamics to achieve results. A water and glycol mix is pumped around the collector circuit, causing the refrigerant in the evaporator to turn to gas. This passes through the compressor, causing the temperature to rise. The hot gas moves to the condenser where it condenses and latent energy if sent into the heating circuit. There are three options for collecting energy from the ground: Horizontal, compact or bore hole collectors. 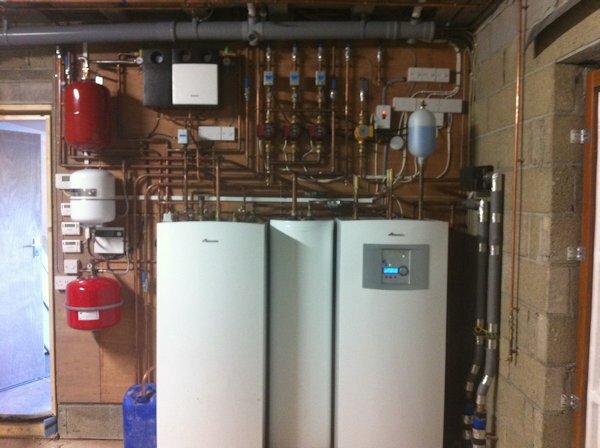 Ground Source Heat Pump installations qualify for Renewable Heat Incentive (RHI) payments, paid quarterly over a period of seven years following the date of installation. The installing company and the manufacturer's appliance both need to be MCS registered and you will require an Energy Performance Certificate (EPC) for your property and a Seasonal Performance Factor (SPF). - Please see News for current tariff rates.